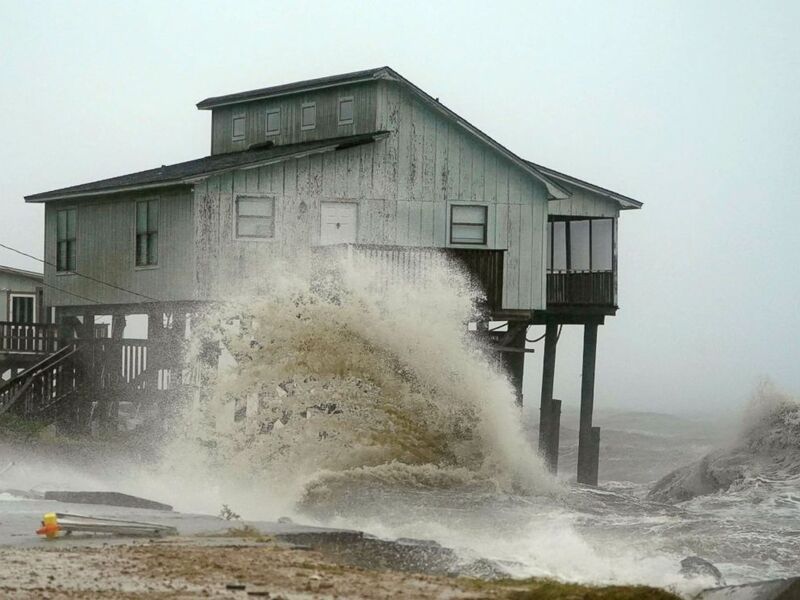 A ferocious and historic Hurricane Michael reached the Carolinas after tearing through Florida and Georgia, demolishing homes, submerging entire neighborhoods and killing at least six people, including an 11-year-old girl. Michael is the fourth-most-powerful storm on record to hit the U.S., and the worst in nearly 50 years, since Hurricane Camille in 1969. It is also the first Category 4 to ever make landfall on the Florida Panhandle, “the worst storm” that area has ever seen,” Florida Gov. Rick Scott said Wednesday. The hurricane hit the Panhandle in northwest Florida early Wednesday afternoon, leaving a trail of devastation. It then roared north through southwest Georgia and on Thursday moved into North and South Carolina, states that are still reeling from historic flooding left by Hurricane Florence last month. “The ragged but raging remains of Hurricane Michael” were in North Carolina on Thursday morning, the state’s governor, Roy Cooper, said. 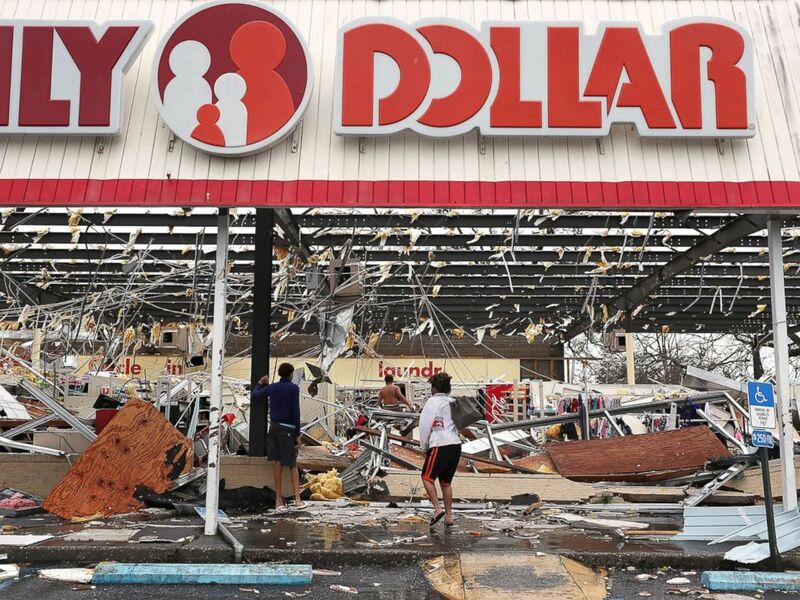 People look on at a damaged store after Hurricane Michael passed through on Oct. 10, 2018, in Panama City, Fla.
ABC News chief meteorologist Ginger Zee said the ruins in Mexico Beach were “eerily reminiscent to the scene I saw in Gulfport [Louisiana] in 2005,” after Hurricane Katrina. A 38-year-old man was killed when a tree fell onto his moving vehicle has he drove on Old Mocksville Highway near Statesville, Kent Greene, director of the Iredell County Director of Fire Services & Emergency Management, told ABC News. For North Carolina, “Michael isn’t as bad as Florence but adds insult to injury,” Gov. Cooper said at a news conference Thursday. Flooding is expected in parts of the state that were previously hit by deadly Hurricane Florence in September, he said. 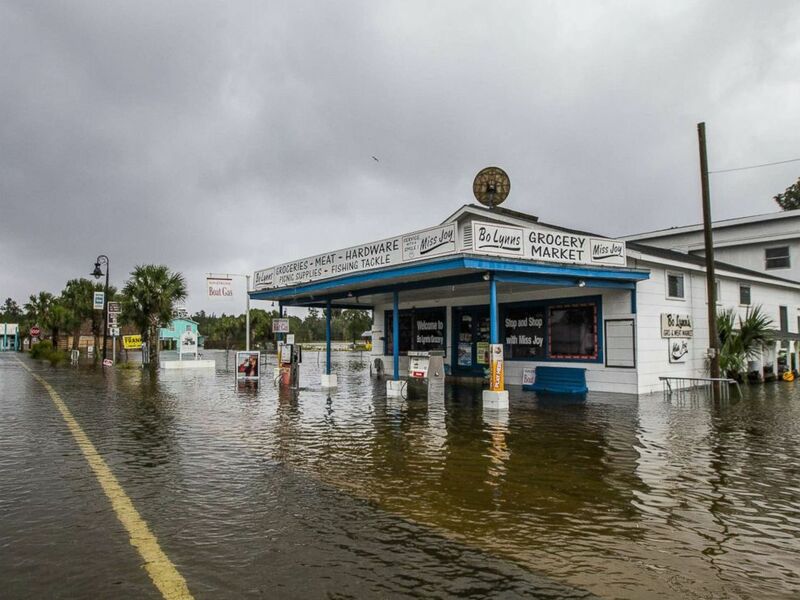 Six inches of rain has drenched the state from Michael with more to come, Cooper said, and water rescues are underway. Much of the state is under flash flood warning or watches as well as tornado watches. Michael is the first major hurricane to blow into Georgia since the 1898. One death has been confirmed in the state. An 11-year-old girl was killed when part of a metal carport crashed into her family’s trailer in Lake Seminole and struck her in the head, local officials said. Her official cause of death was due to massive blunt force trauma, Seminole County Coroner Chad Smith told ABC News. Michael has left over 343,000 in the state without power. In Roberta, Georgia, a reported tornado devastated the small town. Authorities on Thursday begged families to stay inside while they worked to clear an overwhelming number of downed trees. Michael could also have lingering impact on agriculture in state, officials warned. 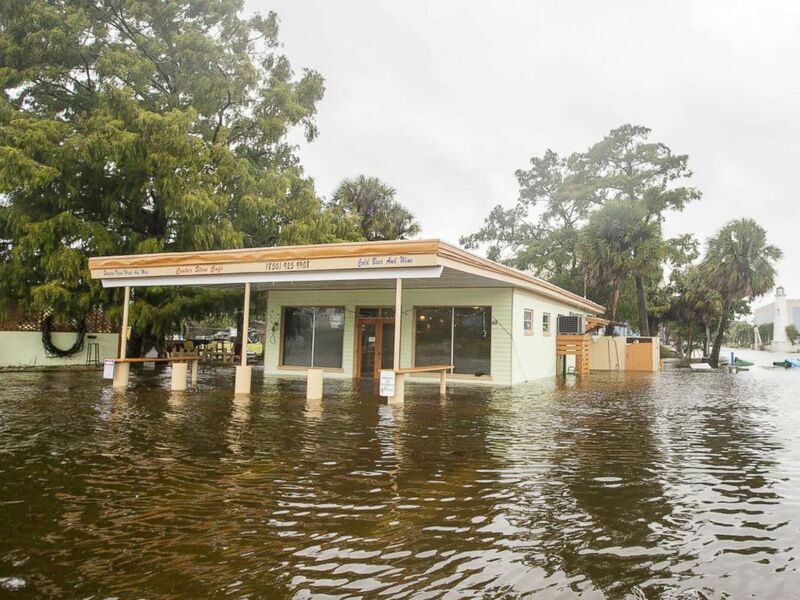 Bo Lynn’s Market starts taking water in the town of Saint Marks as Hurricane Michael pushes the storm surge up the Wakulla and Saint Marks Rivers which come together here on Oct. 10, 2018 in Saint Marks, Fla.
Michael, which Gov. Scott called “monstrous,” made landfall with wind speeds that were nearly the greatest possible for a Category 4 — 155 mph. 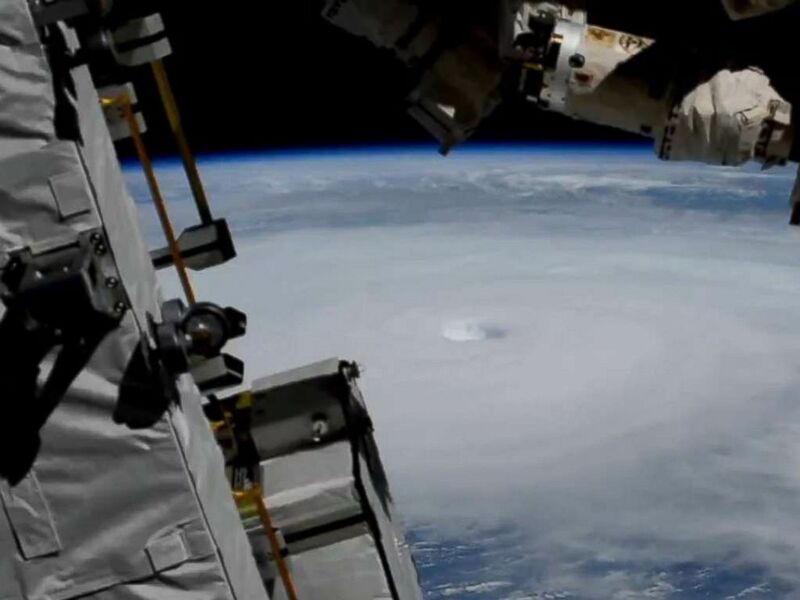 When a hurricane reaches 157 mph, it is a Category 5, the highest possible. At least four people have died in the state. The Florida Panhandle is the wide strip in the northwestern corner of the state bordered by the Gulf of Mexico to the south and Alabama and Georgia to the north. Popular with tourists for its beaches, the area also has many year-round residents. Its largest city is Pensacola, with a population approaching half a million. “Panama City is a vibrant seaside city. Popular vacation spot for both families & college students. 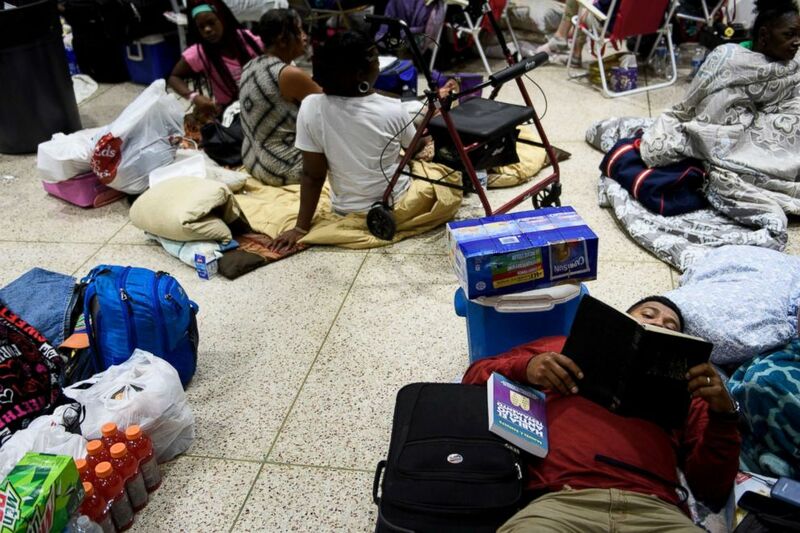 Early reports from locals is catastrophic devastation,” Sen. Rubio tweeted. He described Mexico Beach as an “old old Florida town” that “feels like a trip back in time to a place unspoiled by development. “The worst thing you can do now is act foolishly” by putting yourself in danger or keeping law enforcement from saving lives, he said at a news conference. Among those helping are about 450 Florida Highway Patrol officers, many of whom drove through the night to the Panhandle to help with rescues. Tyndall Air Force base, located 12 miles east of Panama City, suffered “serve damage to the base infrastructure,” the Air Force said. President Donald Trump has issued a major disaster declaration for Florida, allowing for more help from the federal government to flow into the communities. 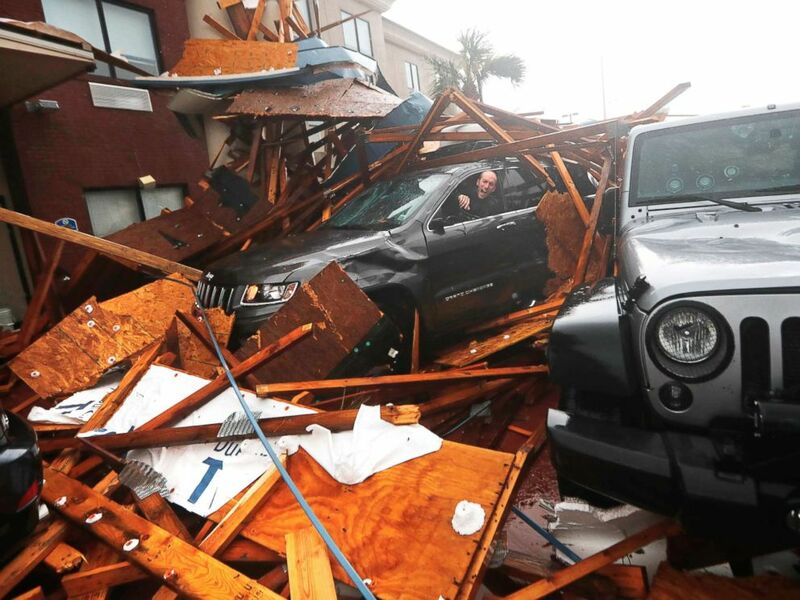 A storm chaser climbs into his vehicle during the eye of Hurricane Michael to retrieve equipment after a hotel canopy collapsed in Panama City Beach, Fla., Oct. 10, 2018. The storm “grew into a monster,” Trump said Wednesday from the Oval Office. ABC News’ Ginger Zee, Anne Flaherty, Kenneth Moton, Will Gretsky, Julia Jacobo, Meghan Keneally, Victor Oquendo, Jason Volack, Morgan Winsor and Scott Withers contributed to this report.